Leadership transitions are tough, but as Shalini Iyer, Director of Programs at Metta Fund, a health funder based in San Francisco learned, they can also be opportunities for deeper organizational reflection. Shalini had been with the organization for a couple years when they experienced a leadership transition. 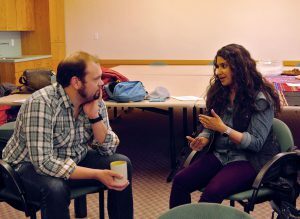 During this time, Shalini was a member of the first cohort of the Bay Area Justice Funders Network’s Harmony Initiative. “Harmony expanded my understanding as a grantmaker, challenging my current practices and giving me a new language to describe my work,” reflects Shalini. Through her participation in the Harmony Initiative, Shalini had time to think about the values driving the organization’s grantmaking processes. Through the incorporation of thought leadership from across the field, Shalini found resonance in a concept espoused by the Grant Managers Network – the grantmaking process may be the only expression of your organizational values that nonprofits experience. Thus, Metta Fund’s executive transition was an opportunity to intentionally align the grantmaking practice with the values of the organization. Rather than continuing to rush through a massive amount of work in a short amount of time, this period of reflective practice created an opening to evaluate the grantmaking process and its underlying habits. “The current practice of grantmaking is largely learned by being thrown in and doing the work,” states Shalini. By using The Choir Book as a framework for how to do equity-based grantmaking, Shalini was able to support the Metta Fund to be more conscious of the burden placed on organizations while applying for funds and reporting on activities. “The evaluation of our grantmaking processes allowed me to challenge my assumptions as a grantmaker and be more strategic in figuring out what was the best grantmaking approach for our foundation,” Shalini said. The most important difference may be developing intentional relationships with grant partners. “When you have an intentional relationship with grantees, you get a better sense of the impact your foundation is having. Thoughtful grantmaking takes the burden off grantees. Grantmakers can better understand where grantees are at, and grantees will want to honestly share where barriers and hardship exist,” she said. By being reflective and intentional about each step in the grantmaking process, we can create mutually beneficial relationships between funders and grantees that promote the values of a justice funder. By building in time between her dockets, Shalini was able to develop thoughtful processes that reduce the burden on grantees. When nonprofits can spend less time on funder requirements, they can spend more time creating impact in the world. And by freeing up grantee partners, funders can facilitate more impact with their finite financial resources. Now we want to hear from you. Have you seen examples of the practices and habits we have described? What other bad habits do you see in philanthropy? What values-aligned practices are working for you? Please send us an email and share what you are seeing and learning and how we might break bad philanthropic habits together.